Former Chester City star Paul Comstive has died at the age of 52 after suffering from a heart attack. The Southport-born player signed from Bolton Wanderers for £10,000 in November 1991 and featured in 56 league games for the Blues scoring six times. Perhaps the best-remembered of these goals came in the first ever league game at the Deva Stadium when he rounded off the scoring as the Blues beat his former club Burnley 3-0 in September 1992. 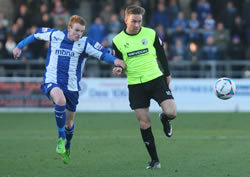 Chester drew the second of their holiday fixtures despite taking an early lead against Gateshead at Deva Stadium. Manager Neil Young made five changes from the side that drew at Southport on Boxing day. Ross Killock along with Lewis Turner returned from injury, Jason Jarrett returned from suspension, Joe Heath replaced Kevin McIntyre and Alex Titchiner came back to replace Tom Peers, who started on the bench. Jamie Menagh had already seen an early effort saved by Adam Bartlett before Killock opening the scoring for Chester on ten minutes rising at the back post to head home a John Rooney free-kick. The Blues dominated much of the opening period with menagh, Jamie Reed, Jarrett and George Miller all seeing efforts not converted. Titchiner and Turner both saw efforts saved by Bartlett as the first half ended with just that one goal advantage. Gateshead came more and more into the game following the break and came close to an equaliser as Liam Hatch saw his goalbound effort cleared from the line by George Miller, the follow-up being squirmed wide. The equaliser eventually came on 68 minutes as James Marwood raced through onto a long ball, John Danby came half-way out but seemed to hesitate and Marwood duly drilled the ball past him into the bottom corner. Both sides had chances in the closing stages but it was the Blues who were left frustrated with just a point after they had dominated for so much of the opening half. Southport and Chester fought out a goalless draw on Boxing Day. The Blues, backed by a following of over 700 supporters, created plenty of chances throughout the 90 minutes but were left to rue those missed opportunities, in particular a last minute one from Jamie Reed, as a result Chester remain fourth from bottom. With the squad depleted through injury and suspension Tom Peers was handed a full debut by Neil Young and the youngster impressed from the start forcing the first save of the game in the opening minutes. Chester’s home league game against FC Halifax Town will be screened live by BT Sport. As a result the game had been brought forward 48 hours and will now take place on Thursday 13 February, kick-off 19.30hrs. Chester’s scheduled league game at Tamworth on Saturday 11 January will now be played on Tuesday 25 February, kick-off 19.45hrs, as the Staffordshire side are involved in the FA Trophy on the original date. Dates for the two outstanding fixtures are now finalised. The Woking game at Kingfield Stadium originally scheduled for tomorrow will now take place on Tuesday 21 January. The away game at Macclesfield Town, originally the 4 January, will now take place on Tuesday 4 February. Both games kick-off at 19.45hrs. Blues defender Paul Linwood received his second red card of the season on Saturday for a foul on Braintree forward Dan Holman. Linwood was adjudged by referee Jason Whiteley to be the last defender. 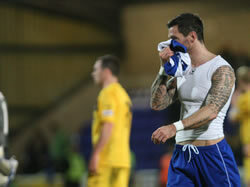 Linwood saw red for a similar offence at the away game with the Iron earlier in the season. Holman went on to score twice for the visitors who completed the double over Chester without reply. Manager Neil Young handed a full debut to youth player Sean Miller while another of the promising youth players, Tom Peers, came off the bench for his debut in the second half. Other changes from the side beaten at home to Barrow AFC in the Trophy last week saw Jason Jarrett, Kevin McIntyre and Craig Mahon drop to the bench with Ashley Williams, Michael Kay and Joe Heath starting. An uneventful opening period saw chances at a premium, Gareth Seddon sent a long range effort well wide and John Danby pulled off a good save to deny Holman before the controversial sending-off changed the game. Braintree took the lead with a twice taken free-kick following the red card. The first effort his the wall but Ashley Williams was adjudged to have encroached, the retaken kick then took a big deflection before finding the net. Just before the hour mark Holman added a second skipping through several tackles before lifting the ball over Danby to seal the game. Chester are not inaction now until Saturday 21 December when they have a home game against Lincoln City, kick-off 15.00hrs. With Macclesfield Town progressing through to the third round of the FA Cup, the scheduled away league game at Moss Rose on 4 January 2014 will now have to be rescheduled. The Exiles have produced a limited edition commemorative Chester FC calendar for 2014 that looks back over the three years of success since the club was reformed. The calendar is full colour and A3 in size and is available now from the club shop priced at £10.00. 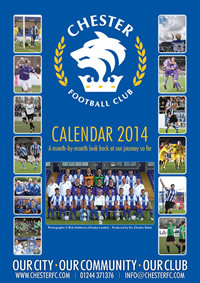 It is also available from the club by post at a cost of £14.00 to include the postage and packing. The club are now selling half season tickets which come into effect with the home game against Gateshead on 28 December. The ticket gives admission to eleven games for the price of nine and of course includes the home game over Easter against Wrexham. The prices are as follows: Adults £144 (seat) £126 (terrace), concession £99 (seat) £90 (terrace), 16/17 year olds £45 (seat or terrace), under 16 £20 (seat or terrace). 1. Neil Young is under contract to Chester FC until May 2014, as explained by Tony Durkin, Chairman, talks will commence in the coming weeks with Neil Young and his advisor regarding his contract. 2. The football club is facing its biggest challenge since re-birth and Neil Young has had and has the unequivocal support of the Board to address the current challenges. Tony Durkin urged all members and fans to get behind Neil and the team at the AGM. 3. As confirmed at the AGM, Jim Harvey has offered to volunteer unpaid, for a limited period to prepare a report that could see the development of complimentary infrastructure to the current youth section and first team i.e. 18 - 21 years. In light of the potentially damaging and inaccurate speculation, the Board will now review with the manager and the youth section whether the consultation will take place or not. 4. Most importantly the CFC Board have an obligation to the members, and fans, to look at ways to improve the football club, it is unfortunate that rumours have circulated and incorrect assumptions have been made. Chester crashed out of the FA Trophy at the first round stage after suffering a 2-1 home defeat by Conference North strugglers Barrow AFC. Both new loan signings, John Rooney and George Miller, started out for Chester who got off to a perfect start with a goal on three minutes from Gareth Seddon and went on to dominate much of the opening half without adding to their slender advantage. Inexplicably Chester totally lost their way in the second period once Marcus Carver had grabbed the equaliser on 58 minutes following a defensive error. Manager Neil Young made to substitutions but the Blues fell behind on 71 minutes as Carver took advantage of some more poor defending to give the Bluebirds the lead. Alex Titchiner saw an effort well saved five minutes from time and defender Andy Higginbotham, pushed up as a makeshift striker, was just unable to meet a teasing Seddon cross in the dying minutes.